We take great pride in giving our patients the best experience in every aspect of their care, from the first telephone conversation to the last post operative phone call they receive. We have earned a reputation for being one of the finest endodontic practices in the area. Our patients routinely leave us in amazement at how painless and pleasant their experience has been. We believe that our patients and our referring doctors are our best source of advertising. We also provide insurance billing services and flexible financing options. Our peaceful office environment includes floor to ceiling open atrium views with an organic stone water fountain, as well as soothing lighting and music. We provide a full range of non surgical and surgical endodontic services, several types and anxiety control techniques, and dental implant services. 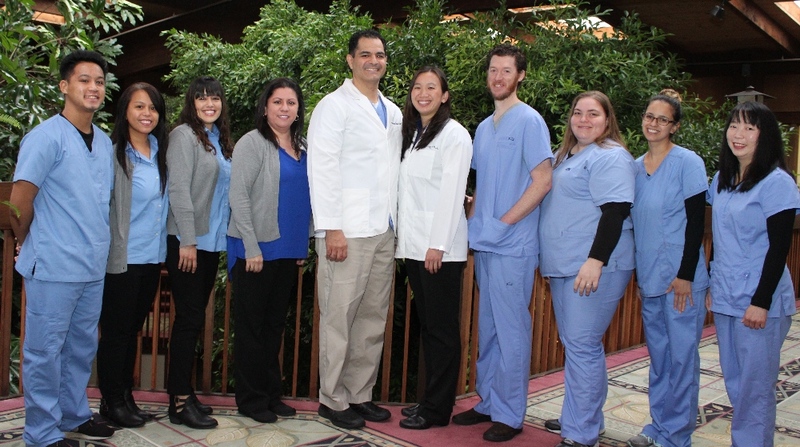 Our team is skilled and competent in all aspects of the practice and each member is eager to help create an enjoyable environment for each other as well as our patients. All team members are dedicated to providing care to our patients as if they were family. We believe in maximizing the use of technology while minimizing our impact on the environment. We are a paperless office, with all necessary forms and paperwork being maintained on our secure network. Our office is equipped with low radiation digital imaging technology. Not only does this include digital dental xray films, but also a 3D Cone Beam Volumetric Imaging system. The advent of this technology for dental applications provides an unmatched ability to properly diagnose and treat our patients. Also, our office is equipped with Zeiss surgical microscopes as well as the latest in sterilization technologies. We look forward to meeting and caring for you. I really cannot say enough good things about Dr. Ahani and his staff! I had a root canal done about 25 years ago by someone who I've long since forgotten. Apparently, a infection had been festering in the root area and it needed to be removed asap. I was recommended to Dr. Ahani by my Dentist, and I am very grateful I went to him to perform this procedure. Dr. Ahani was able to remove the existing post, and not cause damage to my crown. From what I understand, it was not an easy procedure. He and Tyler thoroughly explained to me what they needed to do, and made sure I was comfortable as they worked on my tooth/root. I was pretty nervous about having this done, but it was literally painless. I would highly recommended this fine man and his staff to anyone in need of a highly skilled Endodontist. Daly City Endodontist Dr. Rowshan Ahani offers Endodontics such as Root Canal, Dental Implants, Endodontic Surgery, Cracked Teeth and Traumatic Dental Injuries.